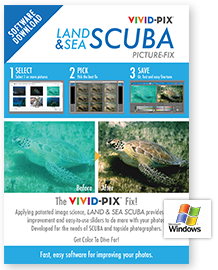 LAND & SEA SCUBA Picture-Fix for Windows: Applying patented image science, LAND & SEA SCUBA provides 1-click improvement and easy-to-use sliders to do more with your photos. Developed for the needs of SCUBA and topside photographers, relive the colorful, vibrant environments as you remember. LAND & SEA SCUBA Picture-Fix for Mac: Applying patented image science, LAND & SEA SCUBA provides 1-click improvement and easy-to-use sliders to do more with your photos. Developed for the needs of SCUBA and topside photographers, relive the colorful, vibrant environments as you remember.